I Won the Lotto Having You as a Teacher - C.R.A.F.T. Teacher appreciation week is next week! Many of y’all know that I was a high school special education teacher for 4 years. So showing Maxwell’s teachers how much we appreciate what they do everyday is high on my list. Not to mention, I will always take another reason to make up cheesy puns! We don’t buy scratch off lottery tickets very often, but I kind of love them. 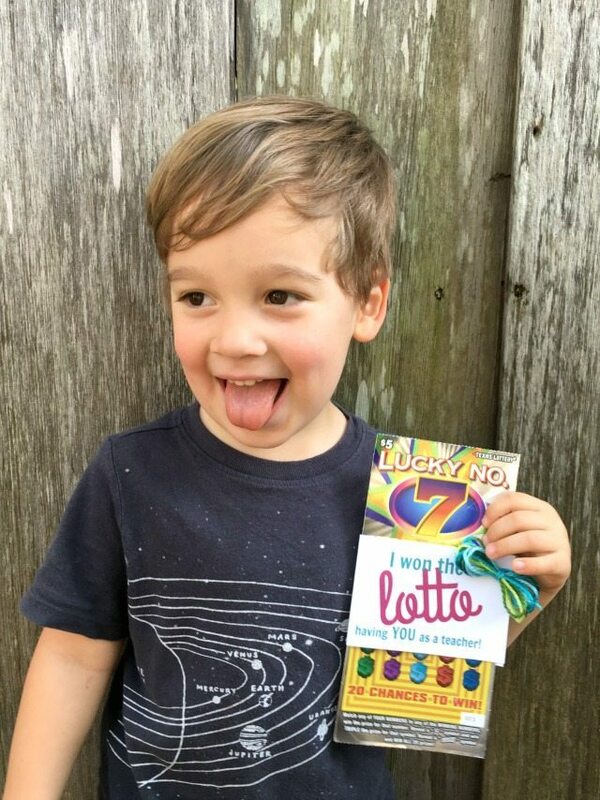 I’ve made a free printables to use lottery tickets as gifts for just about every occasion. It was only a matter of time before the teacher’s got lottery tickets too. I hope both of his teachers know that we seriously believe that we “won the lottery having you as a teacher” this year! In case you’re like me and don’t buy a lottery tickets very often, you can buy them at most gas stations and grocery stores. At the grocery store, go to customer service and you’ll find the scratch off vending machine. (At least in Texas!) Oh and you can only buy lottery tickets with cash. After a little google search I also discovered that 6 states don’t have state run lotteries. 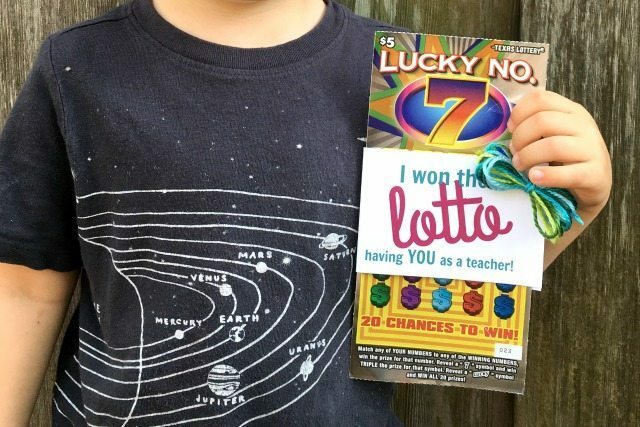 Sadly, you can not buy scratch off tickets in Alabama, Alaska, Hawaii, Mississippi, Nevada and Utah. If you live in one of those 6 states, you could use a few 100 grand candy bars instead of scratch offs. 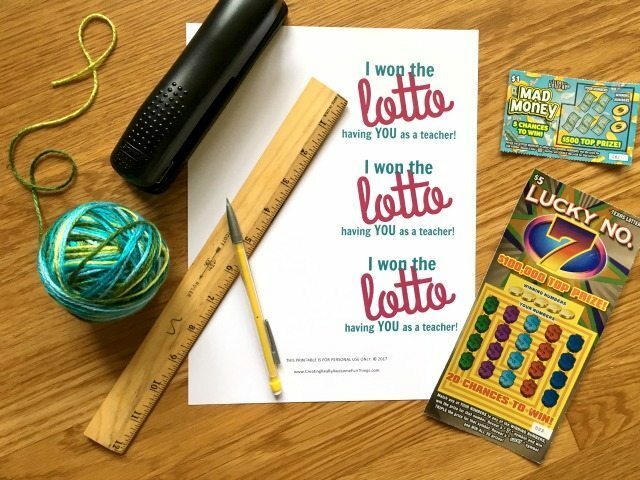 First you’ll need the free “I won the lotto having you as my teacher” printable! To get it, enter your name and email address below and the free file will be delivered to your inbox! After you print your tags and buy the lottery tickets, this little teacher appreciation gift is simple to wrap up. Cut out each of the 3 tags from the sheet. Fold each tag in half and wrap it around the lottery tickets. I made a little bow with yard and stapled it right on to the tag. Easy! On the back of the tag, I added a handwritten “To:” and “From:” and Maxwell added some beautiful art work (aka scribbles). 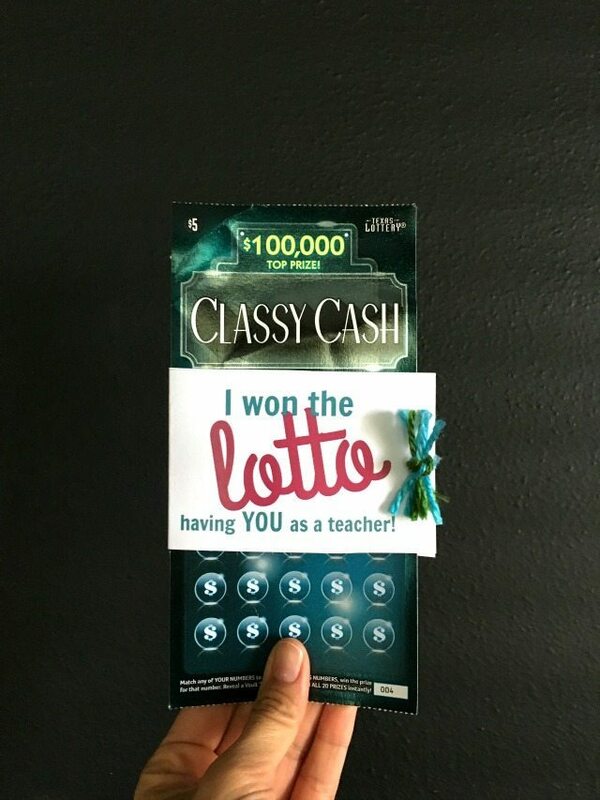 Each teacher got $15 in lottery tickets, they deserve to win it big! There would also work well as end of the year treats too!